I’ve probably made pad thai a few dozen times, with several different recipes, and ultimately the main thing I got from all those experiences was: “Making pad thai is a pain in the neck.” I always used a ton of ingredients, made a giant mess (although, to be fair, I make a mess doing most things), and it never even came out as well as I would have liked. But, my friends, the day has finally come! I have figured out a pad thai recipe that is easy, consistent (I’ve made it four times already), tastes like what I’ve gotten at good Thai restaurants, and all without using fish sauce. I’ll confess one secret to this being easy is to use a bag of frozen stir-fry vegetables (I use the one from Trader Joe’s) – you could of course use fresh but the effort of finding, buying, and chopping all those different ingredients would take this out of the “easy” category I’m so happy to put it in. If you know you love it, you could always get a bunch of stuff, chop it up, and then freeze it in single serving bags for later use. But I don’t think there’s anything especially wrong with using the frozen mixes once in a while – just make sure they don’t have added salt, sugar, or fish. The second confession is that the sauce does involve several pantry ingredients – I happened to have most of them already, but if you don’t it might be a pain to go get them all just for this dish. I don’t know what to tell you about that other than that most of this stuff is pretty versatile and can be used for lots of things. Now that I’ve made what I promised to be an easy recipe sound intimidating, let’s get to making it! First get some water boiling – if you have an electric kettle this would be a great time to use it. While that boils, whip out your 12″ skillet and heat it over medium. Toss your frozen veggie mix in there (along with a touch of oil and some garlic powder, if you want) and let it get nice and warm. It’s important to cook these in advance for two reasons: one, you need to let the frost/water boil off before you mix it with the sauce and noodles, and two, the sauce and noodles get tossed together very quickly, which wouldn’t give the veggies enough time to heat thoroughly. While those heat, soak your pad thai noodles in boiling water for 8-10 minutes (follow the package directions) until they are softened. Drain and rinse them. Meanwhile, mix together your sauce in a medium bowl. As mentioned, it’s got a bunch of ingredients so I won’t list them all here – just check the recipe below. It’s just stuff like vinegar, soy sauce, and peanut butter and it comes together pretty quick with a whisk. You can also taste it as you go and add more stuff if you want it to be more peanut-y or salty or spicy. 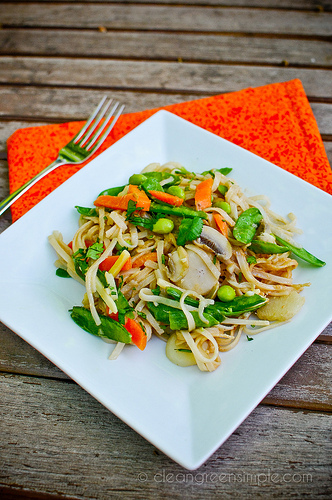 So now you’re 10 minutes into cooking and you should have cooked veggies, soaked noodles, and mixed pad thai sauce. Remove the veggies from the skillet and set aside. Bring it back to medium heat and add your noodles and sauce mixture at the same time, stirring them together as quickly as possible to get the noodles well coated. If you let the noodles and sauce hang out in the skillet too long they will get sort of goopy so try to do this step as quickly as possible. 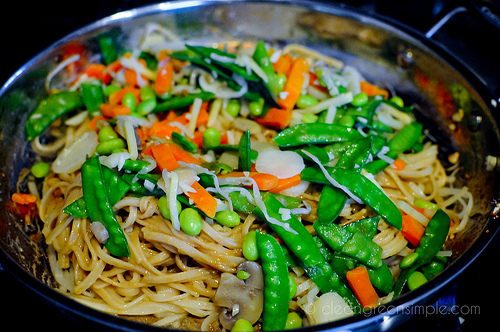 Once the noodles are coated, add your veggies back in and toss quickly to get everything nicely mixed together. Then just separate it out onto 2-4 plates and top with a bit of freshly chopped cilantro if desired. Total time should be under half an hour – it really comes down to how long it takes to boil a half gallon or so of water to soak the noodles. Boil enough water to cover noodles and soak them for 8-10 minutes (follow package directions). Drain. In a large skillet over medium heat, heat frozen vegetables and garlic powder until heated through. In a medium bowl, whisk together sauce ingredients until well combined. 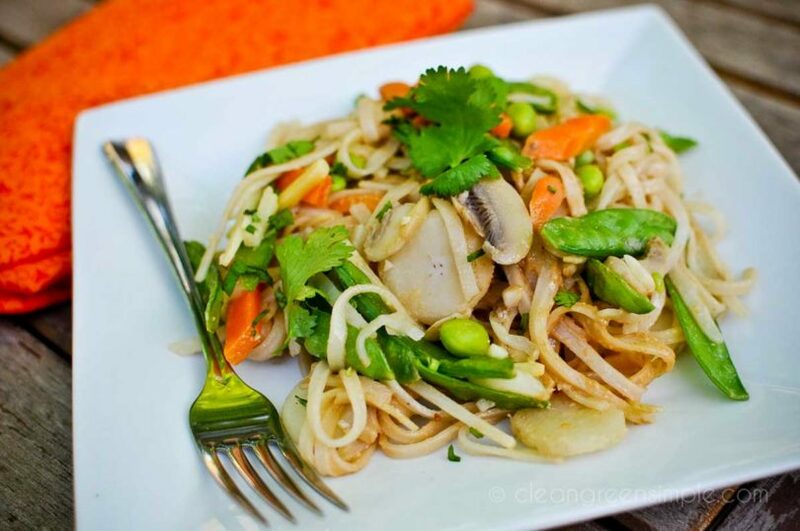 Once vegetables are warm and sauce and noodles are ready, remove vegetables from skillet and set aside. 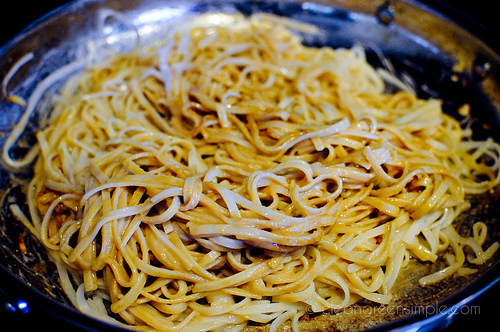 Return skillet to medium heat and add sauce and noodles, stirring together until noodles are thoroughly coated. 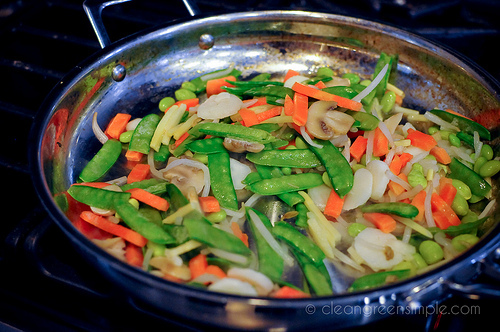 Add vegetables back to skillet and stir to combine everything. Divide amongst 2-4 plates and sprinkle with fresh chopped cilantro, if desired. BAM! Dinner tonight is planned, thanks! Sure I don’t have everything on hand (tamarind paste?? ), but I am sure it will be just excellent without it (will it??). You can also try using 3/4 tsp molasses and a little extra lemon juice in a pinch – not quite the same but adds a certain something. Yum, that looks so good! Really fresh and clean- just how I like it! look so yummy! This recipes is very interesting. Tried making this the other night and was pretty successful, which was great considering I’m a beginner with cooking real meals! Any suggestions on the best way to add tofu to this dish and how to prepare it? Also, any suggestions for an appy to go along with it? My boyfriend and I are cooking dinner for his parents tomorrow night. Thanks! 1) slice firm tofu into 1/2″-1″ squares, marinate it in a 1:1 blend of peanut oil and soy sauce for 30-90 minutes, and then fry the squares in the skillet with the vegetables. 2) scramble medium firm tofu into small pieces and cook it with the vegetables, making sure to coat it with the pad thai sauce once you add it to the noodles. For an appetizer, try a soup (tofu soup or tom yum gai) or a fried rice – I don’t yet have recipes posted for either but google around a bit and see if you can find an easy one, there’s a bunch of them around. For fried rice make sure to use sesame oil, it really makes it taste like restaurant style (but a little goes a long way). Hope that helps! Good luck with your dinner! 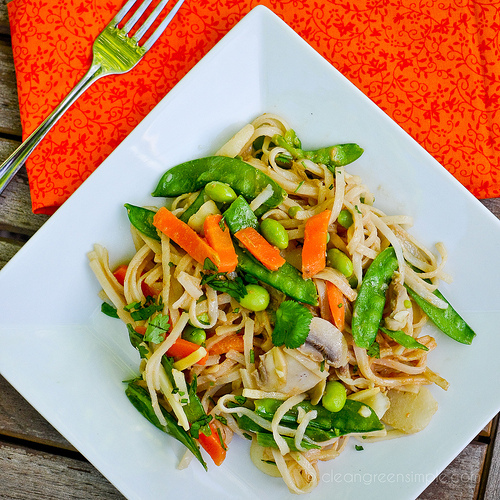 I absolutely adore such quick and easy and soooo good looking recipes as this pad thai. I finally got around to trying this, it makes a nice thick sauce I think due to the peanut butter. The only substitutions I had to make were rice wine instead of the vinegar, lime instead of lemon, and I added a little bit of fish sauce I had left over from previous bouts with pad thai. It makes it a very good dish indeed. 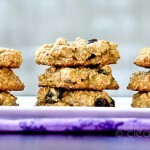 This recipe tastes wonderful! Even my husband loved it, and Asian foods are typically not his favorite. 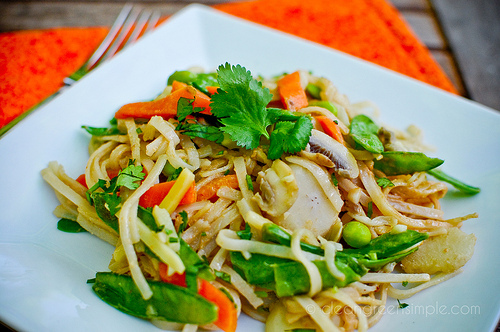 I found that, for the amount of sauce this recipe makes, I needed the full box of Thai Stir Fry Noodles. Also, next time I will reduce the peanut butter by 1/4 to 1/2. I think I would have liked it better a tad less sticky and thick. 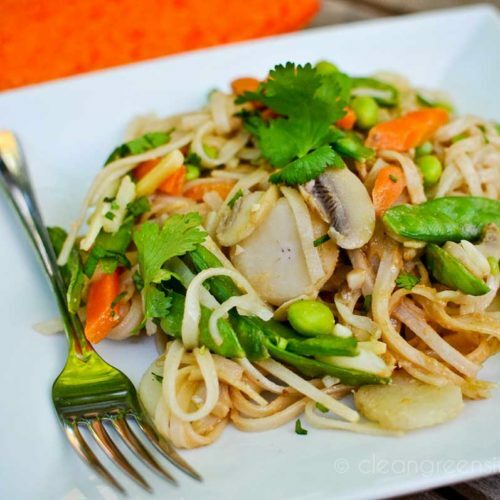 I used fresh vegetables (mushrooms, carrots, red onion, green onion, green peas) and also tofu for added protein. I will definitely make this again soon! Great recipe! Made this for my fiance the other night — and he was reminded why we’re getting married HAHA just kidding!! But really, he LOVED it and I’m making it again tonight. I’ll just going a little lighter on the peanut butter. I made this the other day and had plenty of leftovers– it was somehow even better two days later! 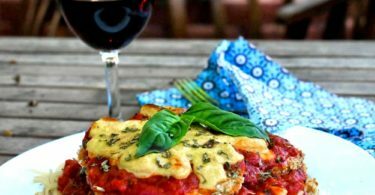 I’ve been looking for a quick recipe that meets all my needs (gluten free and clean) and this is fantastic. Thanks so much for sharing! This is a really good recipe! I over-cooked the noodles quite a bit, so mine is a little bit mushy, but the flavor is great! I also added some red pepper flakes to make it a little bit spicier.